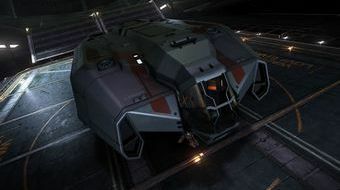 I think I'm in love with my Lakon Type-6 Transporter in #EliteDangerous. Trying to pick this up again. I'm in Grabrigpa in a Type-6 Transporter. I have 3M credits, 100 cargo. How do I succeed? "Type-6 Transporter in Front of a Gas Giant in Front of a Star" or "(;;)"
The spacey cockpit of the Type-6 Transporter. Was the Type-6 Transporter nerfed in cargo capacity?